It’s December 2007 and it’s a proud night for Sir Bobby Robson as he receives the Lifetime Achievement Award during BBC Sports Personality of the Year. As he makes his way to collect the accolade, the great and the good of British sport in the audience stand up to applaud the former England manager. And the applause goes on and on, Gary Lineker admitting later it’s the one time in his broadcasting career that emotion threatens to stop him getting his words out. If Robson is in any doubt about the esteem he’s held in by the English nation, then this night has confirmed just how loved he is. Millions of viewers will also say what a moving moment it is, as they see the adored pensioner receive such an ovation. But Robson wasn’t always the darling of nation during his eight years as England manager. Less than two years into the job he endured chants for his departure following a home defeat by the USSR; he continually had to contend with calls for Brian Clough to be manager instead of him; and the tabloid press could be extremely damning and personal towards him. Amid a circulation war, both The Sun and the Daily Mirror would consider ‘Robson out’ stories to be fair game and in 1985 the latter ran a front page story demanding his departure. But the nadir came following Euro ’88, as England crashed out without a point in a tournament in which English hooligans had again made headlines. It wasn’t a proud time for the nation and Robson was back in the line of fire for the side’s failings. As soon as England arrived home from West Germany, Robson was having microphones thrust in his face at the airport. It set the trend for the next two years. Both of his chief protagonists would make further calls for him to leave and The Sun would soon label Robson a ‘plonker’ without any of the affection Del Boy expressed for Rodney when using the term in Only Fools and Horses. Both titles used a 1-1 draw away to Saudi Arabia in November 1988 as a chance to come up with memorable headlines telling Robson he should leave, but arguably more spiteful was the Mirror following it up a day later by listing 20 reasons why he should not be manager. There is no question that England’s record in the Euros had been very poor and merited both concern and criticism, but the vitriol Robson was contending with seemed to go well beyond what was both justifiable and decent. The flak continued in February 1989, when a low-key friendly away to Greece saw Mirror man Nigel Clarke declare “Robson will be fried” if England came unstuck. They won 2-1, but Robson would recount the episode many times in the years that followed. Amid all this, it was easy to overlook that England were actually in decent form. They completed the 1988-89 season without defeat and a 3-0 win over Poland left them on course to qualify for Italia ’90. They would duly get there without conceding a goal, but so nearly missed out after the Poles hit the crossbar in the dying seconds of the goalless return game. Once again the knives were out following an uninspiring display, critics believing England had demonstrated why they would not come close to glory in Italy the following summer. “Under the deeply uninspiring, cautious and mediocre management of Bobby Robson and Don Howe I really don’t give them a chance,” declared Brian Glanville in the video England: The World Cup Story ahead of the finals. In December the draw was made and it felt like deja vu as England were placed in the same group as the Netherlands and the Republic of Ireland, who had both beaten Robson’s men at Euro ’88. But crucially the other side in the group this time was an unfancied Egypt rather than the Soviet Union, while England would also have a chance of progressing if they finished third. Robson had acted after that Euros exit by not giving another cap to several squad members including Glenn Hoddle and Kenny Sansom. He was now casting the net wide for newcomers and the two-year period saw the likes of Steve Bull, Paul Gascoigne, Paul Parker, David Platt and Des Walker make their debuts and begin to establish themselves. The threat of the hooligans wreaking havoc again meant England seldom ventured abroad for friendlies and they played six successive matches at Wembley after qualifying for the finals. Their long unbeaten record finally went in the last of them against Uruguay in May 1990, shortly before leaving for their World Cup base of Sardinia. But that setback would seem very minor for Robson compared to what the rest of the week had in store. When Robson had broached the subject of his future following Euro ’88, he was given the green light by the FA to continue when many were calling for his head. But with his contract due to expire after Italia ’90, Robson was not receiving positive responses from his bosses over the likelihood of it being renewed. Robson was in serious danger of finding himself out of work and agreed terms with PSV Eindhoven to take charge of the Dutch side after the finals. He was hardly alone among the Italia ’90 bosses in planning for another job after the tournament, with West Germany’s Franz Beckenbauer also moving on. But then the news got out. Robson would be branded a ‘traitor’ and accused of turning his back on his country by certain newspapers for agreeing the PSV deal, despite the fact he was effectively facing the sack. For such a proud patriot as Robson it was hurtful stuff, given he was hardly giving up the job voluntarily and had stuck it out previously when a lesser man would have walked away. Robson noted in the 1990 edition of his autobiography: “The very same papers which had been demanding for so long that I quit were now taking me to task for accepting another job, even though they had told their readers that I would not be kept on.” He must have felt like he couldn’t win. Some papers running stories relating to alleged past matters in his personal life would further antagonise Robson and it all made for a particularly stormy press conference. “Garbage” was how he described much of the coverage, before castigating sections of the media for their conduct as he told them they had “ruined” what the team was trying to achieve. It was certainly far from the way England would have wanted to depart for the World Cup. Things got worse in the final warm-up international away to Tunisia, when they needed a late Bull equaliser to salvage a draw and Terry Butcher was accused of headbutting an opponent. Robson now had to contend with calls for Butcher to be sent home, which he resisted. After all the off-field headlines, England would be glad to play their first match in Group F against the Republic of Ireland on June 11. Gascoigne, whose presence in the squad was in doubt until he shone against Czechoslovakia in April 1990, was picked in a side that mostly oozed familiarity. Forty-year-old Peter Shilton was in goal, with Butcher and Walker in the centre of defence and Gary Stevens and Stuart Pearce occupying the full back spots. Gascoigne joined captain Bryan Robson in midfield, with two natural wingers selected in John Barnes and Chris Waddle. The pairing of Lineker and Peter Beardsley, which had proved fruitful at Mexico ’86, was again utilised up front. In the corresponding meeting two years earlier, England had conceded an early goal and failed to find an equaliser. This time around it was Bobby Robson’s men who forged ahead in the opening minutes through Lineker, but they were pegged back when substitute Steve McMahon lost possession and was punished by Kevin Sheedy. England felt they should have had a penalty when Waddle went down in the area, but they had to settle for a draw amid a Sardinian storm. It was a better result than during Euro ’88 but the match had lacked both quality and sparkle and the criticism quickly poured in. ‘Bring them home’ screamed one headline. The following night saw the Netherlands surprisingly held to a 1-1 draw by Egypt, leaving all four sides level after one match. The Dutch had not displayed the cutting edge shown when they won Euro ’88, which offered some cause for English optimism. But another dark cloud was lurking on the horizon. A story was splashed in the tabloid press that several England players had bedded a hostess. The players furiously denied the suggestion and it drove a further wedge between the squad and media. “There’s people out there who don’t want us to win the World Cup,” said an infuriated Gascoigne in a TV interview, offering a greater depth and seriousness than his ‘clown prince’ image. There had been much talk during the period about the benefits of utilising the sweeper system, as England repeatedly refused to follow the lead of continental sides and instead deployed more traditional defensive formations. But for the Dutch game Robson at last opted to make the sweeping change, recognising the benefits of selecting Mark Wright in the role. There would be suggestions player power led to the switch, but Robson forever maintained it was his choice. Beardsley and Stevens, who had both attracted criticism for their recent England displays, lost their places as Parker came into the team. Robson encountered some of the players he would inherit at PSV who were in the Dutch squad, but a more pressing concern was that England delivered. It was the first inkling that this could be a special summer for England. Robson certainly had a better weekend than Jack Charlton, whose Irish side were criticised for their role in a goalless draw with Egypt. Deadlock persisted in the group and it looked quite feasible that all four sides could finish with identical records, leading to lots having to be drawn to decide who went home. But for England top spot was in their sights by beating Egypt. In a rather surprising move, Robson accepted an invitation to have lunch with a collection of football writers before the game and he received a gift from them ahead of his departure as England manager. “It was time to be gracious, and it all went very well. I must admit I gave it some thought before I attended. But I have never been one to bear grudges – say your piece and get on with life,” he wrote. Another unexpected change saw Robson drop Butcher to the bench, after serving him so well for Ipswich Town and England. He was sacrificed as the sweeper system was put on hold, with Wright picked ahead of him. McMahon replaced the injured Bryan Robson (who would soon be flying home after a second successive aborted World Cup, to his namesake’s great disappointment), while Bull came into the attack. The performance was less impressive than against the the Dutch, but it produced the desired outcome as Wright headed in Gascoigne’s free-kick for the only goal. 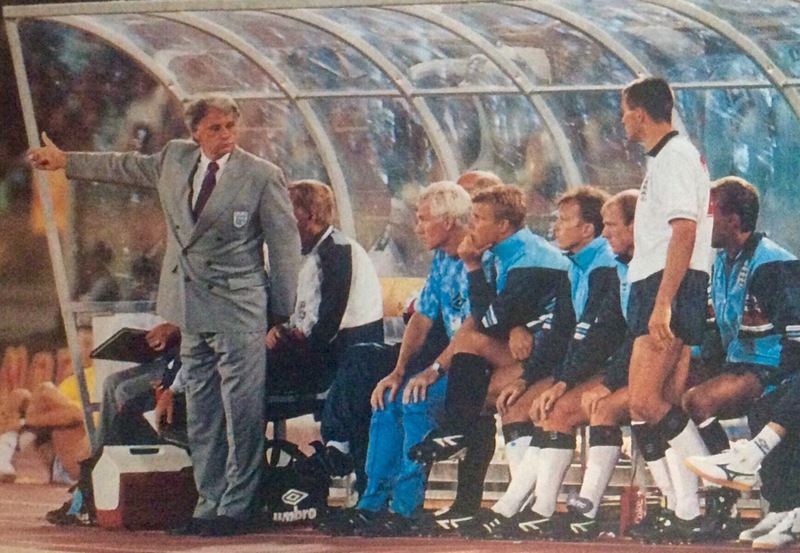 With the match between the Netherlands and the Republic of Ireland ending in a draw, England had topped the group and Bobby Robson knew he had at least one more match left as manager. That would be against Belgium in Bologna, as England at last entered the Italian mainland and joined the real World Cup party. England reverted to using the sweeper, as Butcher was picked instead of Bull. It proved a long and tense night as two closely matched sides sought control. Barnes, whose performances had been concerning Robson, controversially had a goal disallowed; Belgium, featuring the impressive Enzo Scifo, rattled the English woodwork. After 90 goalless minutes, England faced extra-time for the first time since 1970. That too looked set to yield no goals. But in the dying seconds Gascoigne followed Robson’s advice to float a free-kick into the box and substitute Platt gloriously volleyed home. It was a joyful moment and Robson showed how much it meant as he danced a jig of delight on the touchline. It hadn’t been easy but England’s victory was one in the eye for those who had forecast an early departure from the tournament. At the very least they had matched their quarter-final placing from 1986, and gone further in Italy than such nations as Brazil, the Netherlands, Spain and USSR who had already departeed. Had the tournament panned out as expected, England would have faced a repeat of their infamous Mexico ’86 quarter-final clash with Argentina. But the holders had begun the tournament with a shock defeat to Cameroon, who had gone on to top Group B after beating Romania and then knocked out Colombia in the second round. 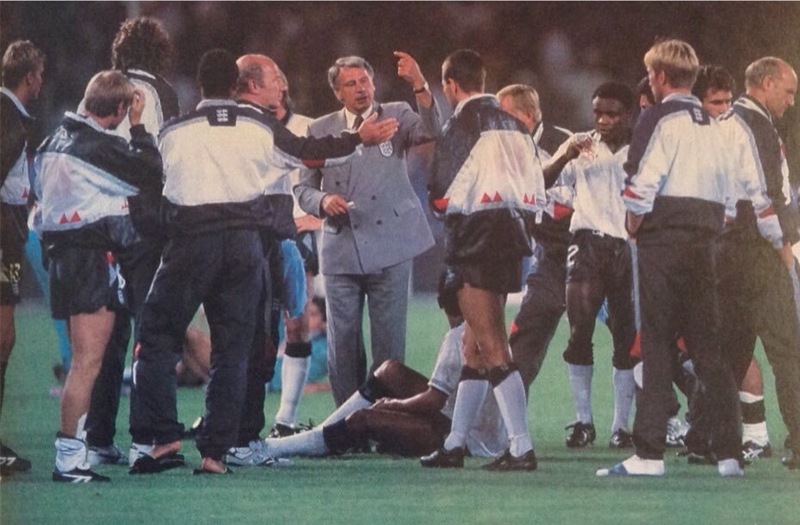 Despite the fact Cameroon had claimed three notable scalps, Howard Wilkinson was not impressed when he watched them suffer a 4-0 defeat by USSR in a dead rubber and reported back to Robson that England could potentially earn a “bye” into the semi-finals. Robson trusted Wilkinson’s judgement and relaid the information to his players, but the match in Naples would prove anything but easy. “Some f***ing bye,” joked Waddle afterwards. Platt was picked to start in preference to McMahon and he justified the selection by heading England into a half-time lead. But looming ominously was the arrival of Roger Milla, the veteran ‘super sub’ with his trademark wiggle by the corner flag. He entered the action after the break and it was now 40-year-old Shilton looking to keep out 38-year-old Milla. His introduction galvanised Cameroon and by the midpoint of the second half they were 2-1 ahead. Emmanuel Kunde equalised from the spot after a foul by Gascoigne, before Cameroon carved England open and Eugene Ekeke finished in style. England were crumbling and it seemed Robson would have to withstand further abuse as he left the job. The ‘See Naples and Die’ headlines were probably already being written. Cameroon had gained control and England were grateful to Shilton for keeping them in with a shout by making a vital block. And then came the moment that would change the course of the night and ensure Robson bowed out a hero. Cameroon had won many admirers for their cavalier approach during the tournament, but their defensive discipline had been more suspect and the side ended with nine players when they beat Argentina. Those frailties were evident again as Lineker was tripped in the area, incredibly earning England their first penalty since February 1986. “Never a more vital penalty for England,” whispered BBC commentator Barry Davies and it really was all or nothing. Robson’s legacy as England boss effectively hung on this kick. Lineker converted and the nation collectively breathed a huge sigh of relief. Lineker would again go down in the box in extra-time – fuelling claims among critics that he’d gone looking for the penalty – and another spot-kick was scored by the forward. 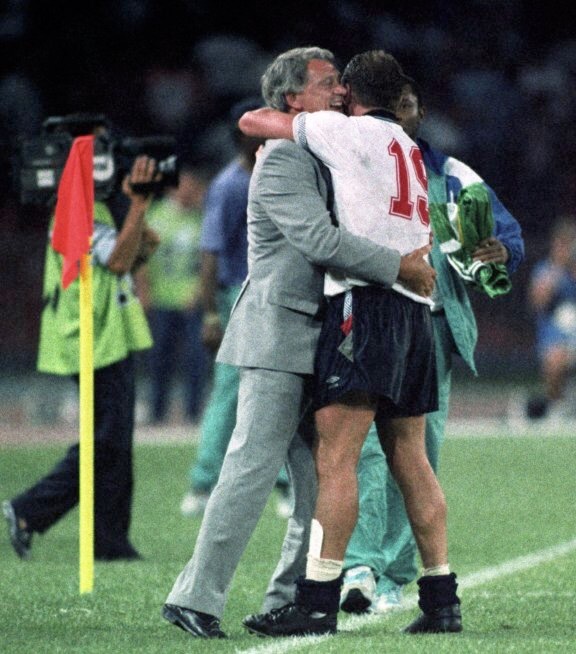 Robson embraced Gascoigne at the end, two men from the same region who would always have a strong mutual affection. In a TV interview Robson would convey his passion for his country. “I wish I was home because they tell me people are dancing in the street. Well I’d like to be home dancing in the street,” he said, beaming from ear to ear. For all the flak he had taken, Robson had now done something no other England manager had – he’d led the side to the semi-finals of the World Cup on foreign soil. It was the only match in the finals in which both sides scored at least twice and a game that Robson would look back at fondly. England had not been convincing but they had shown endeavour and refused to give in when all seemed lost. It perhaps summed up life under their manager, who had stuck it out during some real low points and come out smiling. There would be those who would dismiss England’s wins over Belgium and Cameroon as lucky. It it hard to deny that fortune smiled on them in both games, but they had also made their own luck by fighting on until the end and were rewarded. Argentina, Romania and Colombia had all been unable to draw level with Cameroon after falling behind during the tournament, but England had done so and gone on to win. Robson may have also considered it to be overdue good fortune, given the Hand of God goal was allowed against them during Mexico ’86 and then the ball seemed fated not to go in as numerous chances were narrowly missed in the defeats by the Republic of Ireland and the Netherlands at Euro ’88. Whatever now happened, Robson knew the worst had passed and he could justifiably point out he’d led England to the last four at a World Cup. But he desperately wanted to bow out with the greatest prize of all ahead of a showdown with West Germany in Turin. Interest was growing and press conferences became packed out, as the nation started to dream that 1990 could become comparable with 1966. Previously England had enjoyed five-day gaps between matches but now it was down to just three. With hosts Italy losing on penalties to Argentina the night before, England were now one of just three sides left who could win the World Cup. Robson was convinced Argentina were there for the taking, with the bigger challenge lying immediately ahead of them. The West Germans were favourites, boasting the strong Inter Milan trio of Andreas Brehme, Lothar Matthaus and Jurgen Klinsmann. Barnes had gone off injured against Cameroon and was ruled out as Beardsley finally returned to the starting XI, but the side was otherwise unchanged. A huge TV audience back home watched an England display to be proud of, as they genuinely had a go and gave one of their most praised performances under Robson. It was a night to live long in the memory, from the despair of falling behind when Brehme’s free-kick struck Parker and looped over Shilton to the joy of equalising as Lineker turned home Parker’s cross; from Gazza’s tears over his second booking of the tournament ruling him out of the final (should England win) to the heartache of the side’s first penalty-shoot-out ending in defeat as Pearce was denied and Waddle blasted over. The bond between Robson and Gascoigne was again evident as the manager comforted Gazza before the shoot-out, admitting later he’d been holding back the tears himself. The shoot-out loss brought a further outpouring of emotion among the English contingent. As the West Germans celebrated, Robson summed up just how close England had come as he flicked his hand as if to say ‘so near’. He was full of pride, tinged with regret over what might have been. For Robson there remained one more game as England manager, in the third place play-off against Italy in Bari. It was never going to be a classic, but considering both sides were reeling from just missing out on a place in the final they served up a decent contest that was played in a good spirit. England, who had made several personnel changes, lost 2-1. But yet again they had shown their powers of recovery by levelling through Platt from an excellent Tony Dorigo cross, after Shilton marked his last cap by being at fault for the Italian opener. Such matches may be dismissed as a bit of a non-event at each World Cup, but Robson didn’t take that view and was up shouting from the bench as he looked to bow out with a win. He wouldn’t get it, Italy being awarded a late penalty to settle the contest and prevent a fourth successive extra-time for England. But for once Robson could rest easy about an England defeat. This match quickly became merely a footnote so far as England’s tournament and his reign was concerned. Everyone was still talking about the semi-final and hailing what England had achieved. At the end the players received their medals. They may not have been the ones they had most desired, but they had gone further than many critics had forecast beforehand. The following day the players returned home to a tremendous welcome in Luton, with ‘Gazzamania’ taking hold. 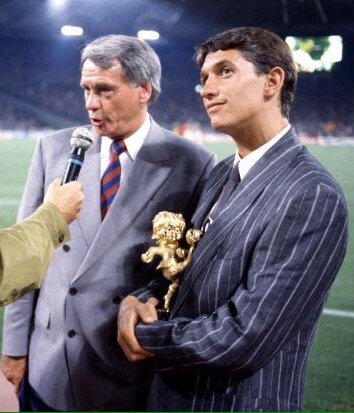 But Robson missed it, having stayed on for the final with Lineker. They collected the Fair Play award at the end, an accolade a long way off being what they had most craved but one that recognised the discipline shown by the side – something that wasn’t in evidence from Argentina during the dreadful final. Further satisfaction for Robson came with the news English clubs were being readmitted to Europe, proof that the nation’s hooligan problem was beginning to ease a little after so often rearing its ugly head during his reign. So by staying for the final Robson missed out on a hero’s return, but he would quickly realise the affection people now felt for him. Previously he’d been mocked for getting names wrong, now it was part of his appeal; he’d endured barracking during his England reign but would now be applauded; where Robson had been criticised for being too loyal to his players, now Graham Taylor was taking stick for discarding them; and as Taylor failed to lead England to the 1994 World Cup, appreciation grew over what Robson had achieved. And it has ever since, as England continually fail to reach the last four of major tournaments – the only exception being Euro ’96 as hosts. Italia ’90 is not universally loved as it has plenty of critics due to its lack of goals and cynical play. But England is one nation where it remains revered far more than most tournaments. England’s run to the semi-final, Nessun Dorma and World in Motion and Gazza’s tears all make it a summer to remember. And right at the heart of it was Robert William Robson, a man who had withstood constant criticism during his England reign but was now bowing out as a national treasure.